During the 1940s and 50s, architects in Cuba searched intensely for national identity in their work. While conservative architects argued for an uncompromisingly traditional aesthetic, radical ones advocated a new style that would make a “clean break from the past.” Still, some architects conceptualized a third option that would converge these two polarities and reconcile the new with the old. By (re)interpreting colonial Cuban architecture functionally, spatially, and aesthetically, these architects synthesized past and (then) present in order to intertwine European and North American Modernism with Cuban socio-cultural, architectural, and urban contexts. Having reached their peak in the 1950s, they developed a body of work that became among the most influential contributions to the search for national identity in Modern Cuban architecture. The “50s generation” of Cuban architects were pioneers of Cuban Regional Modernism. Situated between history and modernity, their work simultaneously looked backwards toward Cuba’s colonial roots and forward toward emerging modes of architectural thinking, discourse, and production. After the revolution of ‘59 however, their critical activity (both in theory and practice) came to an abrupt halt. With the exception of a few projects, their work did not mature beyond suburban experimentation. Had their activity not ended prematurely, their ongoing experimentation would have produced extraordinary results at the hands of a new generation of contemporary Cuban architects. Cuban politics, economics, and socio-cultural contexts, however, are changing fast. While its future remains uncertain, many anticipate preservation, restoration, and urban (re)development, particularly of Havana’s historic core (La Habana Vieja). The danger, however, is that while unsustainable urban (re)development might overlook Havana’s socio-cultural, political, environmental, architectural, and urban histories, a shallow reading of these (which is a step ahead of no reading at all) might materialize as superficial aesthetic imitation—a fetishization of a nostalgic past that merely markets the image of history in the name of profit-driven development (particularly tourism). Both scenarios would be destructive to Havana’s social and built future. With this in mind, the work of the “50s generation” of Cuban architects is particularly relevant today. In order to anticipate Cuba’s future, we have to carefully negotiate its past relative to its present; a lesson that these architects knew very well. Following their precedent, this essay: 1) traces the unfolding of mid-twentieth century Modern architecture in Havana through the lens of specific architectural journals (discourse), pedagogical alliances (education), and their influences on professional design practice, 2) situates Lo Cubano (the essence of “Cubanness”) as the nationalistic ideal sought by the “50s generation;” the cultural construct that mediated and unified both traditional and progressive tendencies, and 3) posits critical and synergetic strategies of architectural and urban design in post-revolutionary Cuba. After gaining political independence from Spain in 1902, post-colonial Cuba was eager to establish an autonomous cultural and national identity. In that search, early twentieth century architecture in Havana went through an “avalanche of styles” (Rodríguez, Havana Guide 8), engaging the new polity with relentless experimentation and zeal. By the 1910s, American Beaux-Arts Neo-Classicism dominated design discourse and practice. By the mid 1920s, Cuban architects engaged an intense eclecticism in which they reappropriated “international” architectural styles to suit their own cultural, architectural, and urban landscape—borrowing, stitching, and super/juxtaposing diverse foreign and colonial aesthetics in search of a distinct, albeit disparate, regional modernity. In searching for regional expression, however, these architects merely stylized Cuba’s architectural and urban history while overlooking its endemic environmental, socio-cultural, and spatial poetics. For while Havana concurrently saw the uprise of Art Nouveau, Art Deco, and Streamline Moderne in the 1920s and 30s, these were all primarily concerned with style as opposed to place. It was not until the late 1920s (post-World War I) that architects in Havana, despite intense resistance from the architectural Right, rigorously discussed, debated, and synthesized Western European and North American forms of Modernism (particularly Rationalism) through the pages of architectural magazines and journals. A platform for intense ideological discourse, these publications exposed an enthusiastic yet cautious embrace of emerging modes of progressive architectural thinking and production in Cuba. In May 1926, for example, the Cuban architectural journal El Arquitecto published the first acclamatory article about Modern architecture, an article by Leopoldo Torres Balbás supporting Le Corbusier’s machine aesthetic. It enthusiastically proclaims that, “other beautiful forms in which we contemplate daily constitute the true architecture of our time and have a suggestive modernity that enriches our spirits. These we can call aerodynamic architecture: the great liners with graceful, energetic curves, formidable battleships, giant locomotives, and airplanes” (Balbás 35).1 Despite acceptance in Europe, however, Cuban architects struggled to assimilate Corbusian avant-gardism. When theoretical and built work failed to adjust, they reverted to the safer, more familiar Art Deco, a style that eventually transitioned into a cheaper, U.S.-born Streamlined Moderne in the 1930s in response to the Great Depression. Facing mounting pressure from conservative “traditionalists,” the editors of El Arquitecto quickly reversed their position, subsequently publishing articles (in the very next issue) ferociously attacking the Modern Movement—both its architecture and it architects—as destructive, arrogant, and counterproductive toward Cuba’s architectural heritage. In particular, Enrique Luis Varela wrote several articles criticizing the “architects of today (who) are bent on destroying architecture” (Rodríguez, Havana Guide 9). These “pseudo-artists”, he claimed, produced functionalist buildings devoid of any artistic aspirations. Furthermore, the works of the European masters, he said, were “ludicrous and unsightly pigeon coops, raised on stilts as flimsy as ice cream cones” (9). Figure 1. Competing architectural magazines, El Arquitecto, May 1929, and Arquitectura, April, 1945. Archival Research, Avery Library, Columbia University in the City of New York. From 1929 onward, competing journal Arquitectura responded to these attacks by publishing a stream of articles championing Modernism—filtering the theoretical and built work of European and North American architects such as Bruno Taut, Walter Gropius, Adolf Loos, Tony Garnier, and Frank Lloyd Wright into Cuba’s architectural mainstream. In one article, technical director Silvio Acosta declared that “true nationalism is to march at the forefront of everything” (20). Alberto Camacho, artistic director and devoted rationalist, attempted to correct misconceptions about the movement. Grounding Modernism in the “critical contemporary shift of authority” (Rodríguez, Havana Guide 10) from a singular colonial power to socially and economically differentiated power structures, the term “modern”, he said, should be understood as “that which is appropriate for a given period” (10) as opposed to static and empty formalism. While the antagonism between Varela and Camacho intensified, Camacho’s untimely death served to ease the tension. Meanwhile, in 1932 the magazine Arquitectura y Artes Decorativas devoted an entire issue to Modern Art—criticizing conservative architects for regressively clinging to the past. One article states that, “To stop, to stagnate, when all around us the world forges ahead without pause, is to retreat…The vanguard or the rearguard, progression or regression; these are the only alternatives open to us” (Rodríguez, Havana Guide 11). By the end of the 1930s Modernism had been generally—albeit within a gradient of criticality—accepted as the dominant mode of architectural production, at least stylistically. The 1940s and 50s would see another cultural debate within architectural discourse in Havana—Modernism’s role in establishing a national identity in Cuban architecture. By the 1940s and into the 1950s, the polemical debates between tradition and modernity made their transition from the pages of architectural journals into architectural practice and education in Havana. The “40s generation” triggered a rebellion against eclecticism that would, by the 1950s, transition into a rigorous and passionate “search for truth;” that is, a search for a genuinely Modern Cuban architecture grounded in both tradition and modernity, one that was at once nationalist and vanguardist. In the process, the Modern Movement was grounding itself in Cuba’s institutional frameworks. In 1943, The Cuban section of the Congress of Modern Architecture (CIAM) was established under the name Agrupación Tectónica de Expresión Contemporánea (ATEC). ATEC’s mission was to filter an institutionalized Modernist ideology into architectural education and practice in Havana, an ideology that would rupture, and subsequently transform both from within. The results from Gropius’s visit were very positive. Our work and the concepts analyzed were exposed to direct criticism, on site, from one of the great teachers of Modern architecture. Furthermore, he established a level of friendship and communication with some of us that persisted until his death. His interest for ‘what was happening in Cuba architectonically’ was firm (Pers. Com. Interview with Nicolás Quintana 2005). Gropius’s involvement with ATEC would keep him involved in Cuban architectural culture, education, and practice throughout the 1950s. Along with Gropius, Havana received frequent visits from elite Modernists: Mies van der Rohe, Philip Johnson, Josef Albers, Welton Beckett, and Richard Neutra—all exerting professional, theoretical, and/or pedagogical influence. While Mies and Johnson designed buildings for Havana, it was Neutra who, in collaboration with Cuban architects Raúl Alvarez and Enrique Gutiérrez, actually built—winning the gold medal from the Colegio de Arquitectos in 1958 for their Mr. and Mrs. Alfred de Schulthess Residence, built two years earlier (1956) (“El premio” 11). Figure 2. Mr. and Mrs. Alfred de Schultess Residence, Richard Neutra, 1956. Published in Arquitectura, January 1959. Archival Research, Avery Library, Columbia University in the City of New York. In December 1947, a specific event took place known as the ‘burning of the Viñola.’ It all occurred around mid-day while a small group of students debated in the corridors facing the interior patio of the school, on the same floor as the library. The debate focused on the futility of the efforts to force a change of focus in architectural pedagogy. Suddenly, moved by an inner impulse, spontaneous and unstoppable, we concluded that what was needed was an act of immediate rebellion that would draw the faculty’s attention in reference to the problems therein. We decided to shake the tree so that, even though symbolically, the rotten fruit of Neo-Classicism would fall to the ground, substituted by contemporary and progressive focuses (Pers. Com. Interview with Nicolás Quintana 2005). He continues, “For the burning, we selected the ‘Tract of the Five Orders’ from Jacopo Viñola, a book that we respected as an expression of culture, but were opposed to as the typical example of an instrument used for the rigid, unimaginative implementation of a plan of study that dwarfed the organic growth of Cuban architecture” (Pers. Com. Interview with Nicolás Quintana 2005).2 Paradoxically, Quintana preserved two copies of the Treatise; for while the Viñola symbolized rigid architectural regression, he recognized—as Cuban professor, architect, and historian Pedro Martínez Inclán wrote in 1929—that “While works of the past may or may not be copied, they will always be full of interest to those who know how to interpret them” (309). Soon after the burning, the University of Havana’s School of Architecture modernized their curriculum to reflect more progressive pedagogical agendas. While radical, the Quema de los Viñola was not unprecedented. Almost a century earlier (around 1845), a Spanish student—namely Elías Rogent y Amat—burned the Viñola Treatise in Barcelona, a precedent that his Cuban imitators claimed ignorance of. As Eduardo Luis Rodríguez points out, “Their (the Cuban students) action ensued from a spontaneous impulse that had earlier fuelled a more burlesque, less drastic gesture: to paint gaudy colors over the classical plaster statues around the studio walls” (Havana Guide 36). In 1948, another set of Viñola’s were burned, this time in Chile, South America. Symptomatic of a strengthening Modernism, the 1950s saw the establishment of several reformatory institutions formed and led by both established and emerging Cuban architects. In 1952, a group of architectural practitioners and academics founded the Asociación Renovadora del Colegio de Arquitectos (ARCA) in order to restructure architectural education in Havana. As a result, a new school of architecture was established at the University of Villanueva the following year (1953), boasting a faculty of high caliber Cuban architects that included Manuel Gutiérrez and Eugenio Batista. In 1955, the National Planning Board was established. The board was led by Cuban architect and Minister of Public Works Nicolás Arroyo who appointed a team of architects to develop a growth plan for Havana. Later, Josep Lluís Sert—Dean of the Graduate School of Design at Harvard University from 1953-1969—was hired to develop a regulatory plan for Havana along with Cuban architect Mario Romañach, a plan that, had it been implemented, would have destroyed the historic core of Havana (La Habana Vieja). While some supported the plan, it served as an awakening for the most astute architects of the “50s generation:” For all the “progress” that Modernism symbolized, overlooking Havana’s rich architectural and urban history was regressive toward establishing a truly Modern Cuban architecture. While Cuban “traditionalists” and “Modernists” battled for ideological supremacy, a synergetic Regional Modernism was unfolding in Cuba, a Modernism operating in between history and modernity, one that would localize the formal, rational, and “universal” principles of European and North American architecture (and later, South American as well) within Cuba’s architectural/spatial landscape (and vice versa). In doing so, the “50s generation” of Cuban architects simultaneously operated within and against the grain of an emerging International Style; that is, while open toward Modernism, their passionate search for national identity fueled a critical resistance toward absolute ideological and stylistic assimilation. Their simultaneous absorption and resistance, in turn, would motivate them to reconceptualize and reposition their own work within the international arena—at once universalizing local Cuban identity and localizing global modernity. While peaking in the expanded decade of the 1950s (mid 40s to mid 60s), Regional Modernist discourse is rooted in the 1930s. According to Morales, Le Corbusier’s definitions were apposite to establish a tropical architecture. Yet, he also argued, the International Style should never be used in Cuba. Large expanses of glass, thin walls unprotected from the sun by cantilevered eaves, and low ceilings were improper for the tropics, where summers may be ten months long (39). Although open to Modernism, Morales recognized the functional value of Cuba’s colonial architecture as endemic to its socio-cultural, architectural, and urban identity. In order for Modern architecture in Cuba to become Modern Cuban architecture, it would have to adapt to the Cuban climate (conceptually and intellectually as well as physically and geographically). Lo Cubano, defined as “the cultural construct composed of the different myths that shape what may be labeled as the nature of Cubanness” (Menocal 38), is ingrained both synchronically and diachronically in the physical, spatial, and environmental fabric of the city; in order to preserve its essence, the coexistence of Cuba’s colonial heritage and radical vanguardism would have to converge. If Camacho claimed that the “modern” was grounded in the present, and Morales claimed that the present is contingent on the past, Batista reconciled the two positions: to be “modern” in Cuba was to ground its past—to spatialize its Cubanness—in the present without resorting to nostalgic historicism. Put differently, Modern Cuban architecture would have to transcend the historical object of style (at least temporarily) in order to re-interpret, re-construct, and re-objectify the essence of (Cuban) place. 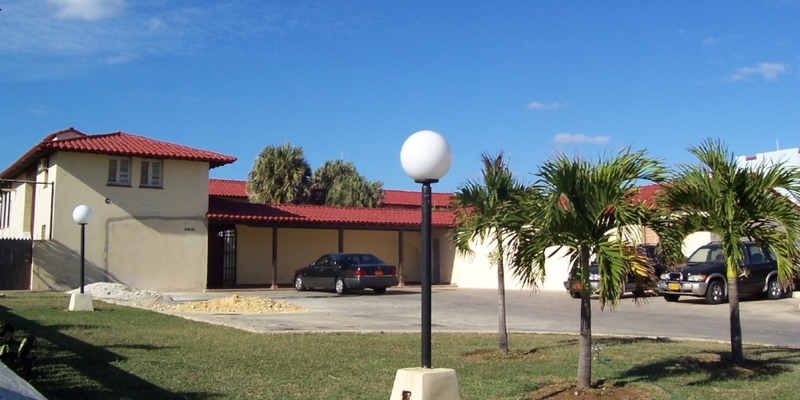 Although he wrote The Cuban House in 1960, Batista materialized his thesis twenty-one years earlier (1939) when he designed the Eutimio Falla Bonet House. Figure 3. Eutimio Falla Bonet House, Eugenio Batista, 1939. Photographed by Author. We only have to point out the radical changes produced by the automobile and the telephone. In times of the horse and carriage, it was an obligatory pastime (as well as very pleasant, despite it being virtually the only one available) of our grandparents to sit in their porches in the late afternoons to greet their acquaintances passing by. The time that a carriage took to pass by the front of the house allowed an opportunity not only for the exchange of greetings, but also for the inquiries about the family. Today, if it occurs to us to sit looking out toward a busy street, in ten minutes we are dazed by the vertiginous and incessant flow of unrecognizable vehicles that traverse the city (5). While Batista understood that the social changes triggered by modernity could not be ignored, he also understood that, despite these changes, Havana’s climate and landscape remained constant. As the definition of public and private transformed, architectural space, particularly the spaces that mediated interior and exterior, would have to be flexible enough to adapt socially yet historically grounded enough to preserve the spirit of place. Batista used the “plasticity” of new (rationalist) design theories, methodologies, and materials toward this end. In reinterpreting the thresholds and transitional spaces of the colonial Cuban house—in sequence from public to private as: portal, zaguán, galería, patio, traspatio—Batista transformed its rigid and autonomous typological configuration into a site specific, modern ensemble. For example, galerías and patios in colonial Cuban houses were separated by a layer of columns and arches, creating visual depth vertically while remaining level in plan. In the Eutimio Falla Bonet House, however, Batista separated them by lifting the galería above the patio, making a physical transition between them by staging vertical movement. Additionally, a large overhang over the galería draws the eye towards the façade, giving the house physical depth horizontally and visual depth vertically. Figure 4. Exploded Axonometric Diagram, Eutimio Falla Bonet House, Drawn by Author. 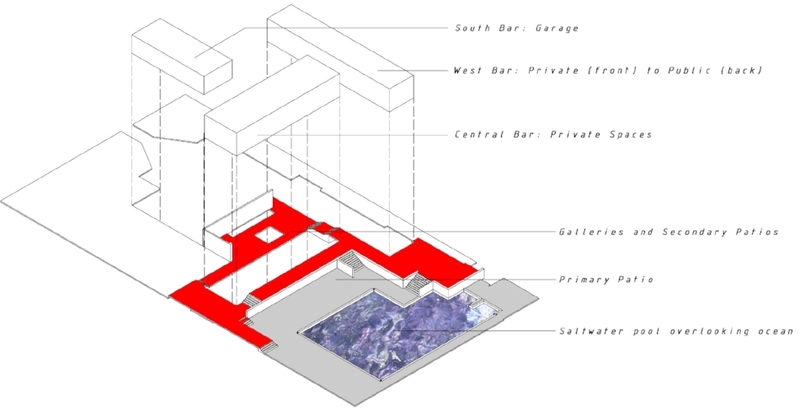 In the urban context (the Eutimio Falla Bonet House was designed in the lush suburb of Miramar) Batista’s elemental “Three Ps” could have richer significance if reconceptualized as the “Five Ts;” that is, the five thresholds/transitional spaces mentioned above. Aesthetics aside, colonial Cuban architecture was a spatially rich urban architecture; indeed, portales and patios (and to a large extent persianas as well) mediated both urban and architectural space/program, situating the outside of architecture as the inside of urbanism. But “outsides” and “insides” are broad multi-scalar constructs with no definite center or edge (indeed the center of one is the edge of another). Mediating the two requires an ecological theory of architectural and urban design practice that integrates both space and place. Figure 5. Threshold and Transitional Space Diagram of Traditional Colonial Cuban House, Drawn by Author. In his 1959 essay Cuban Architecture: A Search for Truth, Nicolás Quintana posits such a theory. Grounded in rigorous research and ecological thinking, Quintana situates local Cuban tradition within its expanded contextual field (what he calls “ambient”) while “understanding people as central” (171). “I believe this essential,” he says, “to study the physical and spiritual context in which everyday life unfolds…but with today’s spirit” (171). Hence Quintana’s thinking is not stylistic (static) but synchronically and diachronically spatial (dynamic). Embedding Lo Cubano—the ultimate cultural truth—in lived space, Quintana paved the way for a new generation of contemporary architects to reinterpret it; for Lo Cubano is not tied to architectural style, nor is it tied to a specific historical moment; rather, it inhabits an ever-changing gradient of the present, continually reconstructed through a critical engagement with history toward a projected future. With a new future on the horizon, how do architects synthesize, conceptualize, and spatialize Lo Cubano in the twenty-first century? More specifically, how does Lo Cubano materialize in post-revolutionary Cuba? The question that Goldberger refers to concerns Havana’s position as the only major city spared the destructive and disfiguring overdevelopment of most Latin American cities (and many global ones) during the last half of the twentieth century; the kind that has enslaved their urban fabric to one of two extreme political /economic ideologies—the capitalist (sub)urbanism of banal and mediocre strip malls, Bank of America’s, and McDonald’s, or the socialist one of faceless concrete block housing. The opportunities are to strategize ways of preserving Havana’s character, its socio-cultural, and spatial fabric in the face of an emerging political and economic shift, a shift that will inevitably, albeit gradually, open Cuba to global market forces. And to do it in a way that critically engages, but does not submit to, these market forces; in a way that does not sacrifice Lo Cubano to profit-seeking developers, ignorant historicists, and/or self-assuming “starchitects.” Indeed, Havana’s emerging Modernity sets the ground to rethink architectural and urban design practice. As Goldberger puts it, Havana is “the only place in which we can plan a metropolis for the 21st century that does not contain within its core the mistakes and problems of every other city of its size in the world” (29). The Cuban Revolution’s indifference toward Havana’s architecture and urban fabric simultaneously ruined and preserved the city. On one hand, Havana is crumbling, its fifty-two year (as of 2011) lack of maintenance inscribed on its cracked, decayed surfaces and the voids where buildings once stood; on the other, its cityscape—its scale, dimensions, proportions, contrasts, continuities, solid/void relationships, rhythms, public spaces, landscapes, and spatial fabric—remains intact. A free-market Cuba, while bringing much longed-for political change, leaves Havana vulnerable to sprawling, unsustainable, American-style urban development—potentially turning it into the Miami of the Caribbean, or worse, a Cuban Disneyland for tourists. While current restoration efforts in La Habana Vieja (Old Havana) are commendable, Havana’s future hinges on forward thinking, not nostalgic (and commercially profitable) resurrection. Contrary to some, Havana is not a city “frozen in time.” It is not a static artifact. It is a living city full of real people with real lives, real ambitions, real complications, and real histories. All cities mediate—and are mediated by—multiple and intertwining ecologies, their socio-cultural, political, economic, and environmental systems. Put differently, cities are structured, formed, and informed by a multiplex synthesis of physical and non-physical forces, forces that architects and urban designers must leverage and negotiate through expanded critical practices. Change in Havana is inevitable. But it is how Havana changes that is important. Romanticizing nostalgia—whether of nineteenth-century colonialism, 1950s Vegas-style consumerism, or 1980s Miami Vice—is counterproductive to Havana’s sustainable future. “Havana must not become Disneyland, but it must not become Houston, either” (29). In order to prevent Havana’s destruction in the hands of unregulated capitalism, preservation efforts must go beyond business as usual; that is, they must look beyond preservation through negation (where, what and how not to build) toward preservation through design (how to design and build in Havana). Only then will architects and urban designers (Cuban and non-Cuban alike) mine opportunities to “build within the architecture(s) of the city” (Fuentes) strategically and intelligently. Only then, will Lo Cubano survive. With this in mind, the work of the “50s generation” of Cuban architects remains not only relevant, but an important part of Cuban intellectual history, one that will undoubtedly influence the future of Havana’s (and Cuba’s) socio-cultural, architectural, and urban fabric. Acosta, Silvio. “Utilidad de la arquitectura moderna.” Arquitectura 4.11 (1929): 20. Print. Batista, Eugenio. “La casa cubana: patios, portales y persianas.” Artes Plásticas 2 (1960): 4-7. Print. Fuentes, Gabriel. “Expanded Territories: Engaging the Emerging Urbanisms of the Developing World.” Unpublished. (2010). Print. Goldberger, Paul. “The Future of Cuban Cities Conference.” Herencia: El río de la cultura cubana 7 (2001): 24-31. Print. Martínez Inclán, Pedro. “La arquitectura de La Habana antigua.” El Arquitecto 4.5 (1929): 309-29. Print. Menocal, Narciso G. “Lo Cubano in Cuban Architecture: 1924-1964.” Herencia: El río de lacultura cubana 7 (2001): 38-43. Print. “El premio medalla de oro del Colegio de Arquitectos de 1958.” Arquitectura 27 (1959): 11-13. Print. Quintana, Nicolás. Personal interview. 10 Mar. 2005. ———. “Arquitectura cubana (1940-1960): la generación del ’50.” Arquitectura Cuba 28 (1960). Print. ———. “Arquitectura cubana: una búsqueda de la verdad.” Arquitectura 27.4 (1959): 167-73. Print. Rodríguez, Eduardo Luis. The Havana Guide: Modern Architecture 1925-1965. New York, NY: Princeton Architectural Press, 2000. Print. ———. “The Architectural Avant-Garde: From Art Deco to Modern Regionalism.” Journal of Decorative and Propaganda Arts: Cuba Theme Issue 22 (1996): 254-78. Print. Torres Balbás, Leopoldo. “Las nuevas formas en la arquitectura.” El Arquitecto 1.5 (1926): 35. Print. 1 Unless otherwise noted, all translations from Spanish to English are my own. 3 Translated from Spanish to English by Raúl García.